My kids haven’t always had the best table manners and for many years I was okay with that. I didn’t want to force my two year old to sit through a long family dinner, and I didn’t want to make my three year old eat all the food on her plate. I was fine if my four year old wanted to stand and wiggle around between bites, and I was okay with my six year old forgetting to clear her plate. But now that my two daughters are 4 1/2 and 7, my leniency over the years is starting to show. If I let them, my girls would run around the table with broccoli sticking out of their mouths, trying to hit each other with strings of droopy spaghetti. I got tired of family dinners turning into shouting matches and threats of “no dessert.” This was not the way I wanted to raise my kids. Something had to be done. The idea I came up with was pure magic. I got both of my daughters involved in an activity of coming up with rules for table manners. It was no surprise to me that they already knew a whole bunch, and they rattled them off pretty quickly. The oldest wrote them down on a list on a piece of construction paper, and when she was finished she put it on the window sill behind our table for reference. The rules for table manners have now become much more concrete. They are not just words coming out of my mouth, floating through the air, they are written words, made by my daughter’s own hand holding a pen, and they are now very, VERY real. Sometimes my girls forget one of the rules, but as soon as someone reminds them, they are back in their chairs and doing what they are supposed to do. Sometimes we open up the list of table manners and point to the manner we are working on and read it out loud. It’s all about having access to that list though. Pure magic. Our family dinners are now, dare I say, almost peaceful. Because I know you are curious, here is our list of table manners. You might have more or less, or completely different ones. Feel free to use mine if you’d like. If you get your kids to do this like I did, I recommend this activity for kids ages 4-5 and up. Do you try to promote good table manners with your children? How do you do it? I would love to know! This is an excellent idea! When I was a teacher, I loved having students make the rules, but I’d never thought to apply it to manners at home! I’m so happy to read this. 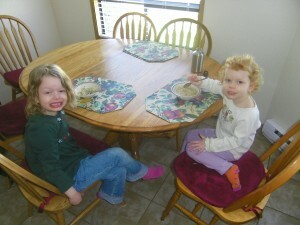 I’ve been so lax on table manners with my two kiddos. They have their own little table and chairs but we are okay with them eating on the floor, on a bike, standing up, running around, watching a show etc. But I spoke with a friend this week whose family with kids slightly younger than mine always sit together and eat and I was starting to get worried that I was making them undisciplined. Now I’ve read this I’ll relax a bit and know that it won’t be too late to introduce some more socially acceptable rules when they are older. Can’t wait to hear what they come up with! Thanks for the great advice and reassurance!